Secant: A line which intersects a circle in two distinct points is called a secant of the circle. Tangent: A line meeting a circle only in one point is called a tangent to the circle. The point at which the tangent line meets the circle is called the point of contact. (1) A tangent at any point of a circle is perpendicular to the radius through the point of contact. (2) A line drawn through the end of a radius and perpendicular to it is a tangent to the circle. (3) The length of two tangents drawn from an external point to a circle are equal. (i) They subtend equal angles at the centre. (ii) They are equally inclined to the segment, joining the centre to that point. Segment of a Chord: Let AB be a chord of a circle and let P be a point on AB. Then we say that P divides the chord internally into two segments AP and AB. Also, if CD is chord and Q is a point on CD produced, then we' say that Q divides the chord externally into two segments QC and QD. (1) If two chords of a circle intersect inside or outside the circle when produced, the rectangle formed by the two segments of one chord is equal in area to the rectangle formed by the two segments of another chord. 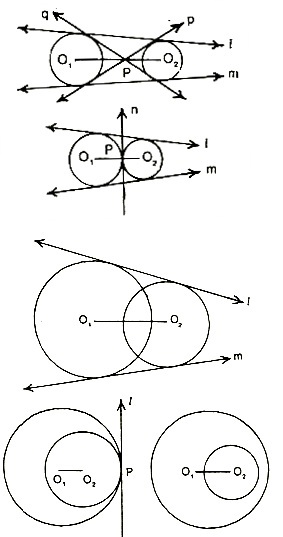 (2) If PAB is a secant to a circle intersecting the circle at A and B and PT is a tangent segment, then PA × PB = PT2. The segment opposite to the angle formed by the chord of a circle with the tangent at a point is called the alternate segment for that angle. (1) A line touches a circle and from the point of contact a chord is drawn. The angles which the chord makes with the given line are equal respectively to angles formed in the corresponding alternate segments. (2) If a line is drawn through the end­point of a chord of a circle so that the angle formed with the chord is equal to the angle subtended by the chord in the alternate segment, then the line is a tangent to the circle. Definition: A line which touches the two given circles is called a common tangent to the two circles. Let C (O1, r1), C (O2, r1) be two given circles. Let the distance between their centres O1 and O2 be d i.e.,? O1 O2 = d.
(a) In fig. (i) d > r1 + r2 i.e. two circles not intersect. 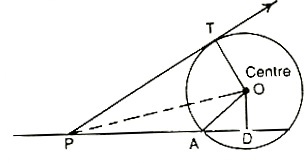 In this case, four common tangents are possible. The tangent lines I and m are called direct common tangents and the tangent lines p and q are called indirect (transverse) common tangents. (b) In fig. (ii), d = r1 + r2. In this case, two circles intersect in two distinct points and there are only two common tangents. (c) In fig, (iii). d < r1 + r2. In this case, two circles intersect in two distinct points and there are only two common tangents. (d) In fig. (iv), d = r1 - r2 (r1 > r2). In this case, two circles touch internally and there is only one common tangent. (e) In fig. (v), the circle C (O2, r2) lies wholly in the circle C (O1, r1) and there is no common tangent. Note: If two circles touch each other (externally or internally), the point of contact lies on the line through the centres. Expertsmind.com offers help with Tangent to Circle assignment and homework in mathematics subject. Experts mind’s math experts are highly qualified and experienced and they can solve your complex Tangent to Circle math problems within quick time. We offer email based assignment help –homework help service in all math topics including Tangent to Circle. We at Expertsmind.com arrange instant online tutoring session in Tangent to Circle math topic. We provide latest technology based whiteboard where you can take session just like live classrooms. Math experts at expertsmind.com make clear concepts and theory in Tangent to Circle Math topic and provide you tricky approach to solve complex Tangent to Circle problems.